Do you have a loaner policy? Yes. ABM will provide like equipment free of charge if it is determined that an “In Shop” repair would cause less disruption. Service and supplies will be billed at the current maintenance rate per your contract. Will you take back something I order wrong?What if items on my order are backordered? You should receive the items within a few business days, possibly as early as the next day. What is a 1/5-cut file folder? There are five tabs across the top of the folder. What happens after I place a service call? When you place a service call your call is entered into our computer system and assigned to a Service Technician. The system immediately pages the technician with all of the information about your account, your machine, and your current problem. Our system logs all of the times - time you called - time tech was dispatched - time tech arrived - time tech was done. This information is then available so that we can accurately evaluate your machine performance and our response to your calls. Why is it that when I dial a number a different number appears on the display after my machine dials? Once you have dialed a fax number the receiving fax machine sends its number to your fax. That is the number that your machine now displays. This is the number that the other machine has programmed into it by the user. If the number is entered wrong or if the phone number has been changed and the machine has not been reprogrammed, then the number will not appear the same as the number that you dialed. What is a monitor filter? Monitor filters protect confidential and private information to meet todays privacy laws. They can assist in keeping health care information and personal financial information private as well as avoiding identity theft. How long will it take to get my new Sharp Copier? Help with my MX-Series Color Copier? Having trouble with your MX-Color machine? Take a look at this great web resource! Courtesy calls are provided to maintenance agreement customers without charge or the need for a phone call. Based on your usage, ABM service will stop by to check and clean your machine to keep it in good working order. Our intention is to provide service calls when it is more convenient for our customers and to prevent the inconvenience of emergency calls. In 2011, over 26% of our total calls were courtesy calls. This type of proactive service adds tremendous value to your maintenance agreement with us. I have lost my manual, can I get a new one? Yes. Please click here and select the model number of your machine. I can't fax to one particular location. How can I figure out what's wrong? First off, anytime you have problems with only one location, there's usually nothing wrong with your machine. You need to make sure that you or your fax machine is dialing the right phone number AND that phone number is being answered by their fax machine. You can test by dialing manually using a handset. Listen to see if a fax machine answers (high pitch tone). If not, check to make sure that you have the right phone number. Note - don't trust that the number you see printed on a cover sheet or listed on your transaction report is the actual telephone number of the sender's fax machine. Cover sheets are sometimes outdated and the numbers programmed in the machine may not be right. The machine may have been moved or the phone number changed. What can I do about an error code that I'm getting on my control panel? Probably not much. If you are frequently getting an error message (E-message on Panasonic - L,U,H, or F on a Sharp), you'll need to call for service. What does brightness of paper mean? Paper brightness refers to the amount of light that is reflected from the surface of the paper. The more light reflected, the higher the brightness value. The brighter the paper the more clearer and vivid the print will be. What is your repair response time? We service an approximant 100 mile radius in and around N.E. Indiana. ABM’s goal is to provide emergency service within 4 hours. For, 2010 our average response time was 2.4 hours, which is well below the industry standard. How do I recycle my Sharp Toners or other Manufacturer's Toners? 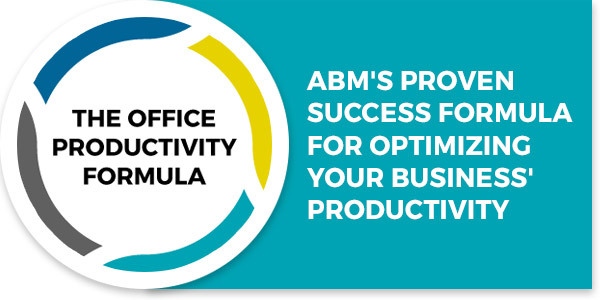 Option #1: Keep the empty toner cartridge and give it to your ABM Delivery Driver or Service Technician. We recycle ANY manufacturer's empty toner cartridge. Option #2:This option is for SHARP TONERS ONLY. Follow the link below to receive pre-addressed, pre-paid UPS shipping labels and ship your empty toner cartridges back to Sharp. The Sharp Toner recycling program is for Sharp Copier Toner products only. Sharp reserves the right to chargeback customers for all costs associated with the shipping and recycling of any Non-Sharp products received. Will I have my own personal sales representative from ABM? Yes, if you wish to have an account representative who can assist you with every aspect of your office supply needs, we will gladly assign someone to you. Also, if you do not wish to have a salesperson call on you, we have customer service representatives waiting to assist you. Will you take back something I order wrong? Our policy at ABM is that if you are not satisfied with your order or product delivered we will gladly pick it up and credit you or provide you an alternative product. MX-C250 Spec. Function, Down Arrow to List Print, OK, Down Arrow to All Cust.Set.List, OK.